Would You Like to Know About Your “Weather”? Is it really necessary to take the extra time to observe weather that is always surrounding one’s side? Although it may not seem meaningful at first glance, one’s perspective will entirely change after viewing the entire exhibition. Weather is arranged in a very organized way, consisting of three separate chapters – “Recognizing the Weather”, “Talking with the Weather”, and “Remembering the Weather”. Furthermore, the exhibition unfolds into a captivating book with the start of a prologue, six stories, and the final epilogue. As the visitors take their first step into the exhibition, the first chapter greets them with an array of lights. The lights, symbolizing sunshine, welcome the audience as the first chapter entitled “Recognizing the Weather” greets them to become more familiar with weather itself that has become too common to recognize separately. Taking a moment to appreciate the surrounding environment in our everyday life is meaningful because one can take a rest from our busy lives. Especially, stories of weather including sunlight, snow, and rain can be felt and areas that are rather excluded, such as darkness, mist, and the connection of the color blue with weather, can be explored in more detail. The story “Darkness” consists of a part of “Recognizing the Weather” and constructs a shadowy pressure which makes the audience rather hesitant to enter at first. The entire atmosphere of the exhibition follows the title of the story and gets darker, with all the lights dimmed to a minimum level. However, in between the black backgrounds, illumination canbe seen in between the art pieces. One of the most memorable art works is the way sunshine may be expressed in daily moments. Consisting of two pieces, “From Sunrise” (2016) and “To Sunset” (2016), the artist James Nizam utilizes sunshine in his own unique way by following the routes of sunlight. In each piece, the pathways of the light are drawn in a time lapse for a duration of six hours by recording the changes of the movements of sunlight. The audiences are guided to climb up the stairs to ascend to the next story. 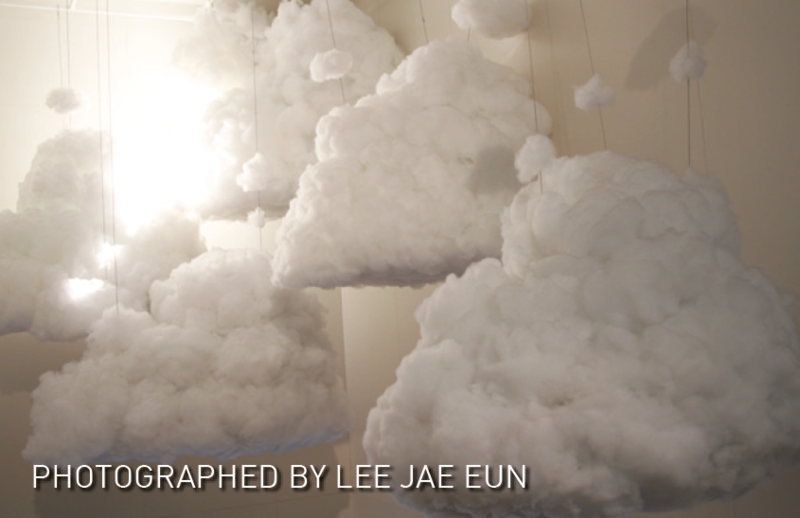 In between the transition from “Darkness” to “Blue”, the actual formations of the cloud are expressed by the artist, Roe Dong Sik in his installation of clouds falling down from the ceiling. The clouds are made of cotton and the surrounding lights add reality to the figure-ground. The setup of clouds function as a connecting link for the spectators to transition into the next chapter. Furthermore, it even adds a sense of inspiration to look forward to what is expected to come and creates a curiosity of what the story “Blue” possesses inside. After the pathway of stereoscopes that expresses diverse colors of blue, more artworks that portray the theme are displayed. Especially, the artist Maria Svarbova's artwork attracts the audience, regardless of the rather repetitive background of swimming pools, by portraying different hues of blue. Particularly, the series of three artworks with two swimmers standing side by side has a noticeable connection. The two people located in the middle seem to show synchronized movements as they head towards the same direction and move in the same way. However, when taking a close glance, it can be noticed that their swimsuits and caps are the exact opposite. Although it seems unsuitable, the common background and actions make a meaningful match. In the upcoming stories, weather is not only expressed just by two-dimensional artwork, but also directly through sound and usage of other types of medium. The story that uses sound elements is particularly impressive, as there is a distinctive section that people may walk in the rain without actually getting wet. Just by the sound of raindrops, people can be consoled by weather. Walking through the darkness merely with the sound of trickling rain, sounds of rain falling delivers the sense of comfort to the audience and enables them to focus directly on weather without any obstacles. This section is in particular an opportunity to interact and sympathize with weather. Despite the intention of this exhibition, which was to enable the viewers to come across a message and connect with weather itself, it seems relatively difficult as certain areas are too overcrowded. For instance, people tend to gather tightly in the areas that are attractive and desirable to take photographs in, which seems distant from the initial purpose for the audience to admire the scenes. It becomes hectic when the atmosphere of the stories gets disconnected by those distracting others who are simply wanting to appreciate the artworks. Throughout the entire exhibition, the audience not only interacts with the diverse moments of weather but also becomes amused by the various approaches from the viewpoints of artists and how they connect to daily life. Instead of the common aspects, unfamiliar and fascinating scenes of weather can be observed. The beautiful integration of darkness and light with the natural environment, exploring the various tones of the color blue, and walking through sounds of rain in the darkness are all scenes that are valuable and worth taking a view. Weather does not simply imply the conditions of our surrounding environment, as the significance broadens to reviving one’s memory and feelings. It is a valuable experience to explore the various moments, as well as getting to know your own weather.